Although the article below by the U.S. Trade Representative is pretty partisan and self-serving, it does underscore one very important and often overlooked point. Services are an extremely vital component of the U.S. economic engine and their exports are very undervalued activity with massive expansion potential. As the global economy expands, demand for high quality services in such areas as engineering, architecture, interior design, construction management, legal, consulting, education, insurance, micro-finance and many others, expands with it. U.S. originated services are very highly regarded around the world and are very competitive. They may be financed by U.S. Ex-Im bank in the same manner as manufactured goods. Yet, not enough U.S. firms make efforts to export services globally. Yes, providing U.S. services in foreign countries often requires higher degree of customization and understanding of the local market. It requires a lot of support and handholding. It requires more rigorous risk mitigation and compliance tools then those utilized by exporters of manufactured goods. Partner due diligence, intellectual property and trademark protection and management need to be more prudently addressed, export credit insurance put in place for services provided on open account, proactive public relations and political risk insurance explored for activities such as ongoing technical assistance revenue and ongoing royalty payments. At the same time service providers avoid customs, shipping and warehousing, often treacherous activities faced by conventional exporters who ply their wares in the emerging and frontier markets. Also, with the advent of technology many service providers can leverage modern video and teleconferencing to help augment the process and reduce costs of entry into the target markets. 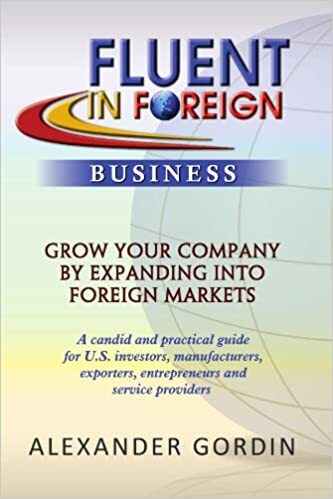 In short, as conventional manufacturers battle for their export market shares and as competition from China, Vietnam, Europe and Japan forces many U.S. firms to move production or assembly into local markets to be closer to consumer, exports of services still represent a fantastic upside for American firms and many more should explore ways to enter the arena of international business. In our daily work with exporters, franchisors and investors, we see disproportionate number of service oriented businesses seeking to expand internationally and are delighted at the degree of high demand they experience from markets as diverse as China, UAE, Turkey, Philippines, Singapore, So. Korea, Brazil, Mongolia, Russia and Canada. As our nation seeking to bolster its economy through international expansion, American service firms must aggressively adapt and convert their mentality into one of global scope. Opportunities are simply too vast to pass up and a very coveted moniker of “Made In the USA” should become synonymous not only with U.S. manufactured goods, but services, as well. Most people may think of Made-in-America exports as tangible goods such as heavy equipment and agricultural products, but the Obama administration has been seeking markets for American exports of all kinds—including services. The United States today is a services trading powerhouse, and it’s vital that we build on our already robust services surplus with dynamic new opportunities. Next month, the U.S. will host the 12th round of negotiations in the Trans-Pacific Partnership. Those critical talks will follow closely on the heels of a number of key engagements with America’s global trading partners, including last week’s Summit of the Americas, this week’s meetings of the G-20 trade ministers, and May’s Strategic and Economic Dialogue with China. In June, the trade ministers of the Asia-Pacific Economic Cooperation forum (APEC) will meet in Russia. In all of these fora, the U.S. will be seeking new avenues for American businesses to sell more of their products around the world, and to hire more workers in the services sector, which already accounts for four out of five American jobs. The U.S. is the largest services trading country in the world, with $1 trillion in two-way trade in 2011 and a services trade surplus last year of $179 billion (up 23% from 2010). In what economist Bradford Jensen defines as the fastest-growing services sectors, Bureau of Economic Analysis data show that the U.S. in 2010 had a trade surplus of $57 billion with the Asia-Pacific region, of $44 billion with the European Union, of $35 billion with the countries covered by the North American Free Trade Agreement (Canada and Mexico), and of $25 billion with the rest of Latin America. America’s robust services exports reduced its overall trade deficit by 24% in 2010. Much of America’s services success comes from the significant market-access provisions negotiated in our bilateral trade agreements. Because the U.S. has few barriers to the import of services, a huge benefit comes from provisions in new trade agreements providing American firms access to overseas services markets. The Obama administration believes the U.S. services sector can do even more business overseas.A commitment to services exports is why services and investment are a cornerstone of the current nine-country Trans-Pacific Partnership negotiations, in which the U.S. is seeking broad, nondiscriminatory market access for a wide range of services. We are also pushing to establish the fairness of competitive express-delivery markets, to set new e-commerce principles that would support electronic delivery of services without forcing American providers to locate servers overseas, and to ensure that U.S. investors can use U.S. technology and aren’t forced to favor another country’s technology. We also worked during the recent visit of Chinese Vice President Xi Jinping to secure a commitment from China to open its market for American providers of automobile insurance. The Obama administration is enforcing and asserting the rights of U.S. services providers around the world, from the September 2010 case we filed at the World Trade Organization to open China’s electronic payment services market, to the agreement that Vice President Joe Biden struck in February on distribution services for high-quality American films in China. Service industries are vital to U.S. economic growth and employment, so the Obama administration is working every day to ensure that services exports support more and more jobs here at home. Mr. Kirk, a former mayor of Dallas, is the United States trade representative. Training employees on cross-cultural paradigms has become of utmost importance to successful business dealings. 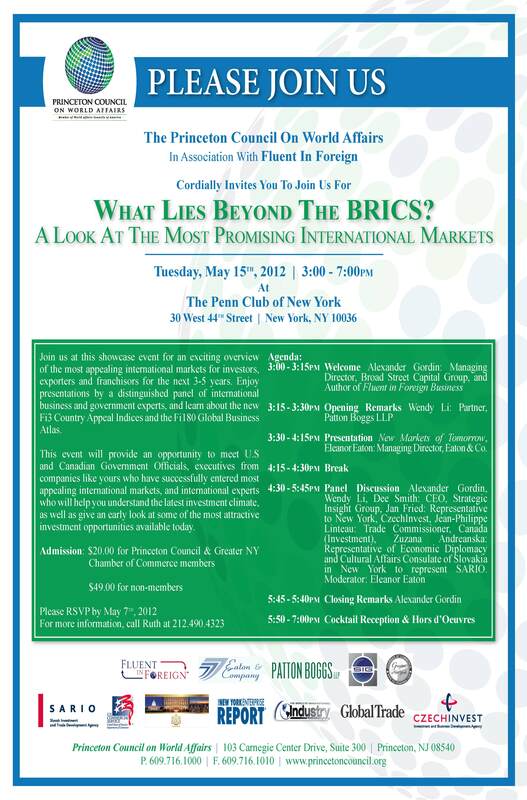 NEW YORK, NY—April 11, 2012 — Fi3E™, a new proprietary and forward-looking index that measures the relative attractiveness of 180 nations to companies looking to export goods and services abroad, is being introduced today by Fluent in Foreign™ LLC, a New York City advisory group that guides companies as they seek to establish or expand their business beyond their own country’s borders. The Fi3E Export Country Appeal Index™ is the third and final index to be introduced. All three indexes are designed to help companies do business abroad. The Fi3F™ index, for franchisors, launched in February and Fi3I™, geared for companies and individuals looking to make direct investments abroad, was launched last month by Fluent in Foreign, which is headed by Alexander Gordin, author of the international business guidebook “Fluent in Foreign Business.” The book was published last summer by the Princeton Council on World Affairs. China ranks as the country that’s most appealing for exporters, followed by Australia, the United States, South Korea, Mexico, Thailand, Mongolia, Canada, Vietnam and India. To obtain information on how to get the rankings of all 180 countries, visit www.fluentinforeign.com and register as subscriber. Fluent in Foreign LLC is a unique advisory and information platform designed to help direct investors, franchisors and exporters enter foreign markets or expand existing international operations and assist clients doing business with new countries and governments. Services include financing, political risk insurance, legal compliance and strategic business development.